Kimberly is a Registered Social Worker, holding a Master of Social Work degree and a Bachelor's degree in Psychology. Her professional experience includes clinical case management, counselling and group facilitation in the child welfare system for high-needs children and youth, as well as in community-based programs for those who struggle with eating disorders and for individuals with intellectual disabilities in conflict with the law. 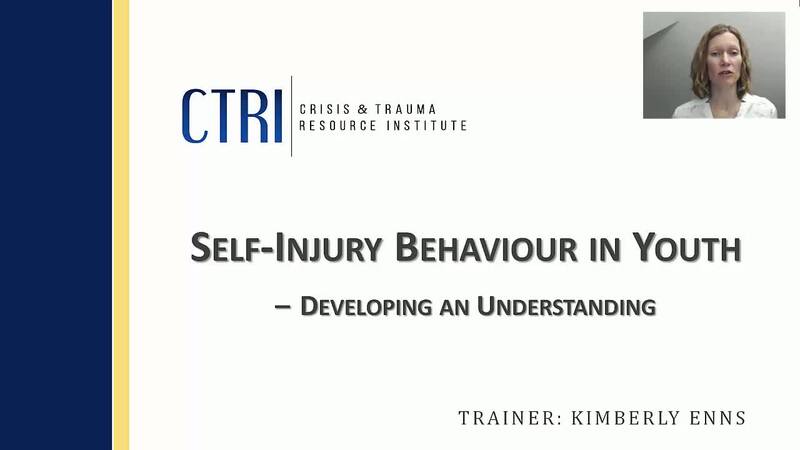 In addition to her work with CTRI, Kimberly maintains a private counselling practice for individuals, couples and families, specializing in the areas of trauma recovery, anxiety, depression, self-injury behaviour and disordered eating and body image. Her therapeutic approach is one of warmth and collaboration, recognizing that people are resilient, have inherent wisdom about their lives and are hard-wired for connection with others. Constantly pursuing her own growth as a therapist, Kimberly believes that helpers are energized by fresh ideas and approaches. She draws on her experience in the field and passion for these issues to provide energetic, enlightening and interactive presentations. Self-injury refers to deliberate, self-inflicted tissue damage such as cutting or burning. Self-injury has reached alarming proportions among our youth – studies show that 14-24% of adolescents and young adults have engaged in this behaviour at least once, with a quarter of these reporting current, chronic self-injury. This webinar will assist participants in understanding the experience and motivations of adolescents who intentionally injure themselves.